A bus in a power system is defined as the vertical line at which the several components of the power system like generators, loads, and feeders, etc., are connected. The buses in a power system are associated with four quantities. These quantities are the magnitude of the voltage, the phase angle of the voltage, active or true power and the reactive power. In the load flow studies, two variable are known, and two are to be determined. 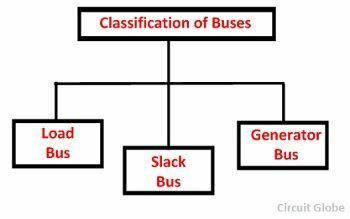 Depends on the quantity to be specified the buses are classified into three categories generation bus, load bus and slack bus. The table shown below shows the types of buses and the associated known and unknown value. This bus is also called the P-V bus, and on this bus, the voltage magnitude corresponding to generate voltage and true or active power P corresponding to its rating are specified. Voltage magnitude is maintained constant at a specified value by injection of reactive power. The reactive power generation Q and phase angle δ of the voltage are to be computed. This is also called the P-Q bus and at this bus, the active and reactive power is injected into the network. Magnitude and phase angle of the voltage are to be computed. Here the active power P and reactive power Q are specified, and the load bus voltage can be permitted within a tolerable value, i.e., 5 %. The phase angle of the voltage , i.e.δ is not very important for the load. Slack bus in a power system absorb or emit the active or reactive power from the power system. The slack bus does not carry any load. At this bus, the magnitude and phase angle of the voltage are specified. The phase angle of the voltage is usually set equal to zero. The active and reactive power of this bus is usually determined through the solution of equations. Very Good site. Everything is in very proper manner. I found the solution of my many doubt here. It really cleared my confusion and explained very good all the concepts.